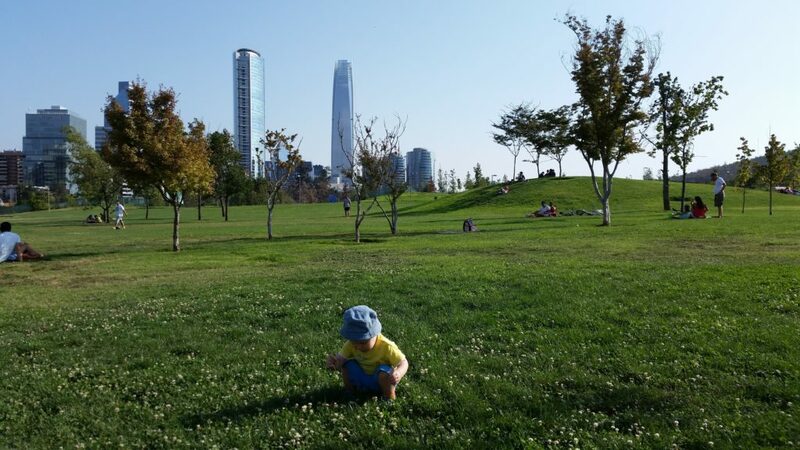 It is the end of September and spring has arrived in Santiago – you can tell from hay fever, a nice floral scent everywhere, warmer temperatures AND: Children full of energy, hard to tame! When the weather is fine, there is nothing better than having the kids romp outside. We would like to help our au pairs out and present our favorite parks and plazas here (the order is NOT a ranking). Parque Araucano awaits you with one of the city’s largest playgrounds, right next to the bustling Parque Arauco shopping center. It is divided in two parts, one with play equipment for smaller children on hard rubber floor and one with endless sand for digging and gorgeous equipment for climbing, made for older children. Bird aviaries complete the experience and on weekends, sometimes puppeteers do shows in the park. In summer, the water games (fountains from the ground) are very much fun – bring bathing suits and towells! 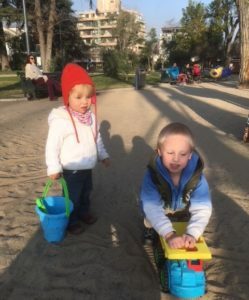 This beautiful square in a quiet green area is also divided into two parts and offers a bike training track on one side and on the other a very good selection of play equipment for different ages as well as lots of sand. Attention, take snacks and water, there are no shops. This very large park offers a lots of open spaces for playing football, running around and picnicking, as well as cycling paths and playgrounds for various age groups. In the eastern area there are ponds with flamingos, fish and swans that you can feed. Pros: Plenty of space for your own games, variety of playgrounds, nice views, ponds, cafeteria, toilets etc. Cons: No sand, playgrounds for toddlers and older kids far apart from each other. Shadow only at the toddler’s playground. At the weekend very busy and crowded. This plaza in the middle of a quiet residential area is just the right mix of games, space, shade / sun relation and size, to make several children of different ages happy! One of the few spots to play in the sand in Santiago, plus an ice cream parlor/coffee to go and bakery nearby. Even when crowded, you do not lose the overview. We wish all our current au pair in Santiago de Chile a nice start to the spring! You are still planning to become an au pair in Chile? We’ll help you, just contact us and we’ll arrange your au pair stay in Chile and, if necessary, a Spanish course in Chile.